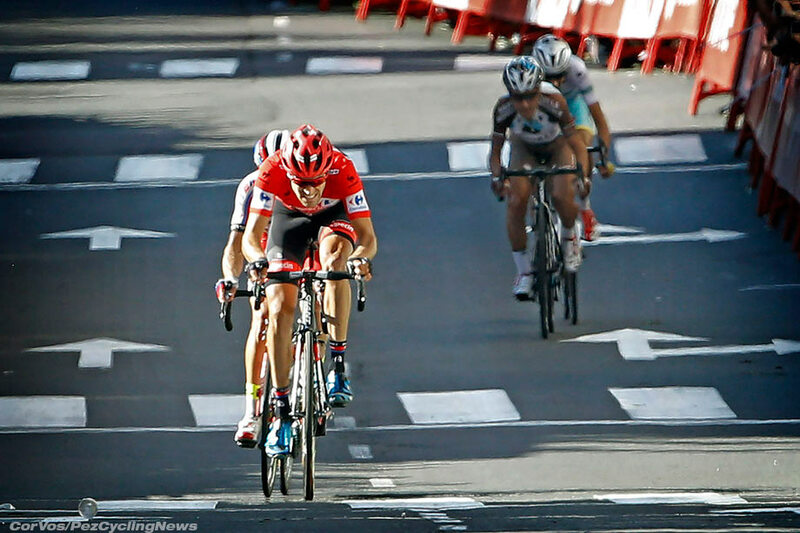 PezCycling News - What's Cool In Road Cycling : Vuelta’15 St.19: Gougeard Gets It In Avila! 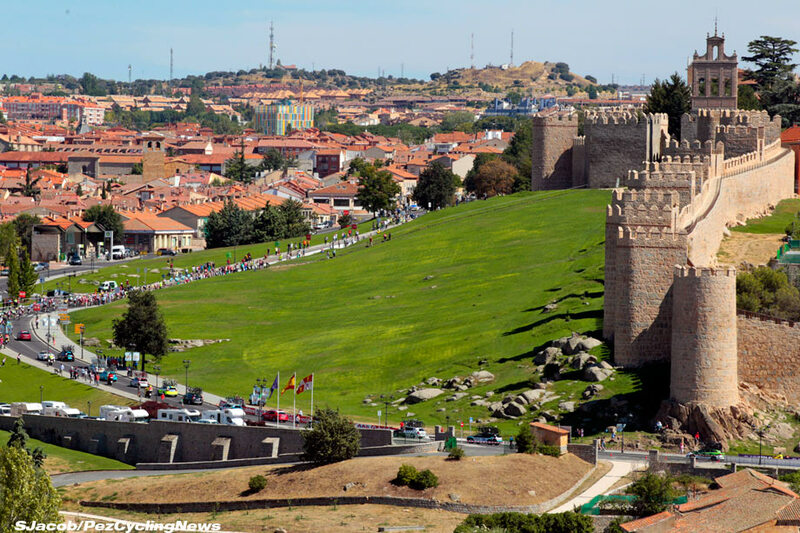 Vuelta’15 St.19: Gougeard Gets It In Avila! Race Report: It was a case of two races on the road today and one of the most attacking men of this Vuelta - Alexis Gougeard (Ag2r) finally played it perfectly and took a superb win into the ancient city of Ávila. In the overall Movistar tried- and failed - to break the will of Tom Dumoulin as they headed towards the cobbled climb into the stage finish. Once again La Vuelta, which was languishing in the doldrums a mere decade ago, is proving to be the best Grand Tour of the season. Sure, it doesn’t have the passion of the Giro in the eyes of the fans and watching media, it doesn’t have the grand spectacle of July in France but what it does have is pure, eyeballs-out racing from the drop of the flag. Tom Dumoulin (Giant-Alpecin) is another day closer to Madrid and has confounded everyone by being able to fight off every attack and hang on to his slim 3-second lead. Fabio Aru (Astana) has tried everything he can over the last coupe of days, and will continue to do so until all hope is lost. And Joaquim Rodríguez (Katusha) will have to try something special, from a long way out, if he is to claw back the time he lost in the TT. All three winners, unlike most years, would be a popular victor in Madrid but there can be no denying that the home crowd would love to see the ‘little cigar’ from Barcelona take the win in, quite possibly, his last chance to do so. But the race route of today’s stage would make it difficult. Two big climbs but both coming too far away from the finish to really have any impact. 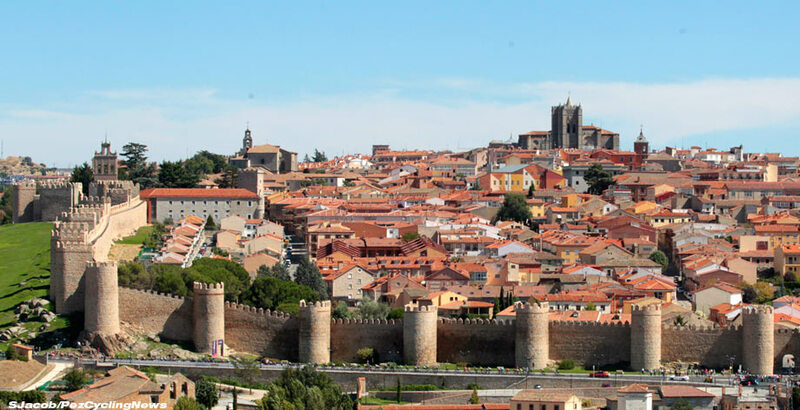 The real fight would be up the cobbled entryway to the ancient walled city of Ávila. A cruel little drag that could only result in seconds of a difference if there was a split. But then Aru only needed seconds. As usual, a group formed up and was allowed to escape on the early part of the stage. Twenty four riders made up this overlarge bunch but with David Arroyo (Caja Rural-Seguros RGA) being the best placed at over 30-minutes down, Giant was happy to let them go and they steadily built a lead which had reached 13 minutes when there was some upset back in the peloton. A crash and Aru was on the ground and race leader Dumoulin was held up. Both were quickly away but Aru made a couple of trips back to the medical car. This confusion meant that the gap to the leaders stretched out to 16-minutes by the time the lead group came over the first summit, the Cat 3 climb of the Alto de Valdavia at 1440m. Maxime Bouet (Etixx-Quick Step) took the points from Christian Knees (Team Sky) and Ricardo Vilela (Caja Rural-Seguros RGA). With such a large group away, it was thought today could be a real chance for a breakaway win; and Movistar had placed two riders in the group to protect their lead in the team competition over Team Sky. With the gap hovering between 15 and 16-minutes and with the breakaway on the lower slopes of the Alto de la Palamera it was now looking as if there were two races: one for the stage win which would come from this group and one for a handful of seconds back in the peloton. First to show his hand was Tiago Machado (Katusha) who was not waiting to see how the others would fare on the climb. He quickly opened up a gap of 30-seconds and was probably hoping that someone else would come and join him. Markel Irizar (Trek Factory) decided it was going to be him but what a time to get a puncture! The others couldn’t decide who would do the work and who they could let go and riders came and went while all the time the gap grew to the main peloton behind. Eventually Alexis Gougeard (AG2R-La Mondiale) and Leonardo Duque (Colombia) made it three in front and immediately Machado was put in difficulty, paying for that initial effort as they approached the sprint point at El Barraco. Gougeard led through the sprint with Machado dangling off the back. And they were only halfway up the mountain. Another 4km to the summit at an average gradient of 4.7% was always going to hurt at this stage. And hurt it did but it was Duque who couldn’t hold the pace and slipped back. Machado stuck with Gougeard for a while but eventually the Frenchman left him behind. There was a bit of organization behind as Maxime Monfort (Lotto Soudal), Andrey Amador (Movistar) and Amael Moinard (BMC) came up and joined Machado 25-seconds down on Gougeard. Gougeard took the summit on his own with the other four some 30-seconds back and the peloton at almost 18-minutes and just starting to climb. A little kick up on the descent and the climb to Ávila but other than that it was all-downhill from here. Movistar had upped the pace in the peloton and Orica-GreenEdge was staying very attentive to protect the overall position of their man Chaves. The quartet had been pulling Gougeard back and as he got to the 5km banner the gap was 18 seconds but the Frenchman was looking really strong and it was going back out as the four behind were thinking about the amount of work they were doing. 4km and then 3km and it was 30 seconds and the four behind had blown it as they were arguing about who was and wasn’t working. Behind in the peloton, the Red Jersey group had been whittled down to about 20 riders and Valverde (Movistar) was trying to draw Dumoulin out but he was sticking determinedly to Aru’s wheel. Under the flag and Gougeard was on the cobbled climb up towards the city walls, his lead now 42-seconds as the chasers had thrown away their chance. Into the city streets and on towards his best professional win as the young Frenchman’s attacking racing had finally paid off. Nelson Oliveira (Lampre-Merida) had made it onto the chasing foursome and gone right over the top to take second place on the stage by 40-seconds. Moinard won the sprint for third but really those guys will be kicking themselves tonight. Valverde was pushing behind and Astana was attentive but it was Rodríguez (Katusha) who might lose the points jersey if the man from Murcia managed to get away. With teammates helping, Valverde was slowly being pegged back as Lawson Craddock (Giant-Alpecin) was working for his Dutch leader. 3km to go for the main race and Valverde was just off the front but looking back possibly for a move by Quintana (Movistar). Onto the cobbled ramp and suddenly, drama, as John Degenkolb and Lawson Craddock attacked with their leader Dumoulin on the wheel. They swept by Valverde and opened a gap on a desperately chasing Aru. Into the city and Dumoulin was in time trial mode with Dani Moreno (Katusha) in his shadow and Aru chasing behind, looking for any help he could get. There was no catching the Red Jersey and by the line he had taken time from the Astana rider. This was not what was predicted but Dumoulin constantly surprises us by rewriting the script of this race. It was a superb performance from Gougeard but an even better one from Dumoulin who is now one day closer to taking the top step in Madrid, but nothing’s certain until the fat tenor sings tomorrow evening.